This is a genuine OEM printhead assembly for the iCube printer. Foil sealed in box. #LIFE SPAN#This printhead is expected to last for a finite period of time. Typically it should last for approximately 3.5 litres of ink (14 ink cartridges), however this is not a guarantee. The printhead could last longer or shorter than this depending upon many environmental and usage factors as well as the condition of the printer's service station module which is responsible for maintenance of the printhead. Another key factor that will affect printhead life is the width of the labels being printed in relation to the width of the printhead. The printhead life stated above assumes that the full 220mm width of the printhead is in use at all times. Printing narrower labels will reduce the effective life of the printhead. For example, if you are printing labels which are only half the width of the printhead, it follows that the half of the printhead being used will only last for its share of the 3.5 litres of ink (1.75 litres of ink, or 7 ink cartridges). By natural extension of this fact, printing onto very narrow labels will result in much more frequent printhead replacement. We recommend that where possible labels should be manufactured to maximise printhead use. Typically if your printer is printing labels containing a lot of white lines, streaks or obvious banding which the printer's normal printhead cleaning routines do not resolve then your printhead may be wearing out and in need of replacement. 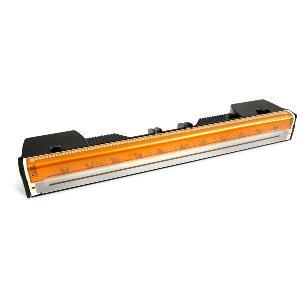 #LIMITED WARRANTY# This printhead is supplied with a limited warranty. The warranty covers failure or damage discovered at the time of purchase or immediately following installation in a printer. However, printheads that develop faults following a period of use, no matter how short, are no longer covered by warranty and may not be replaced. Printheads that are damaged as a result of label media jams or due to the user carrying out printhead cleaning processes by hand will not be replaced under warranty. KTEC Technologies Ltd reserve the right to decline the replacement of faulty printheads if we believe the failure may have been caused through mis-use or mis-adventure. By purchasing this printhead you are indicating that you understand and agree to these terms.